David Moore, 2nd Cavalry Regiment, played on his second All Armed Forces softball team last month in Oklahoma. 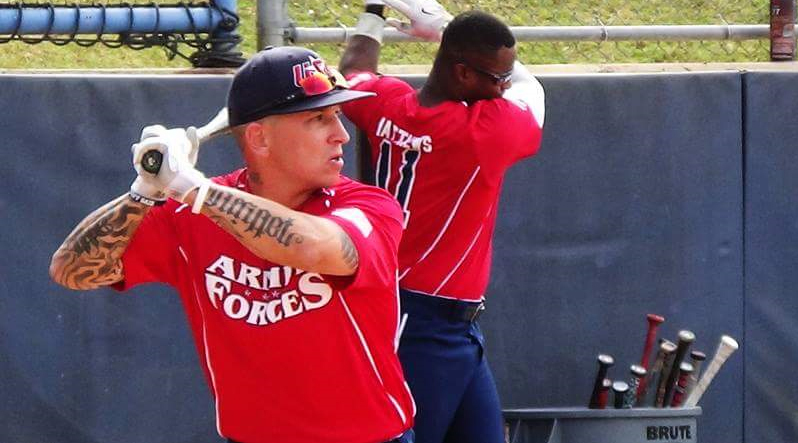 GRAFENWOEHR, Germany – A Soldier with the 2nd Cavalry Regiment helped the Army win its fourth consecutive Armed Forces Softball Championship. This year marked the fourth time that David L. Moore, a platoon sergeant with Echo Forward Support Troop, Regimental Engineer Squadron, 2nd Cavalry Regiment, made the All Army team. He was also named to the All Armed Forces team for the second time. However, Moore labeled the tourney victory “bittersweet,” as several of his teammates played on their final All Army team. “We have some guys that have been in the program for a while who will not be returning,” he said, referring to teammates Kenny Turlington and Thomas Fuss, and coach Victor Rivera. Following the All Armed Forces tourney, Moore was selected to the All Armed Forces team, which he called humbling. The All Armed Forces team placed tenth in the American Softball Association Class A Slow Pitch National Championship, held Oct. 2-4 in Oklahoma City, Oklahoma.